Fortified by an arsenal of alcohol, Israeli occupation army bulldozer driver Moshe Nissim did enjoy his work by killing hundreds of Palestinian children, women and unarmed men in the jenin camp. First published in the Israeli daily Yediot Ahronot and since reprinted on the website of the Israeli peace group Gush Shalom, his testimony gives a version of the barbarian and inhumane massacre that took place on April 13, 2002. “I found joy with every house that came down, because I knew they didn’t mind dying, but they cared for their homes. If you knocked down a house, you buried 40 or 50 people for generations. If I am sorry for anything, it is for not tearing the whole camp down,” he says. Nissim’s army unit received a military commendation for its efforts in killing Palestinians in jenin. During the month of March 2002, Israel launched its ''Operation Defensive Shield'' with incursions into the seven main Palestinian towns. In each incursion, Israeli troops, tanks and armored vehicles entered the cities and imposed a curfew on their civilian population. 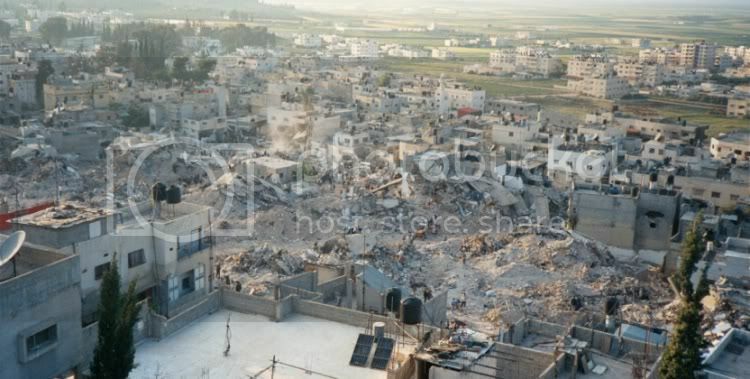 On the 3rd of April 2002 Israeli occupation forces surrounded jenin city and its refugee camp, controlled all the access roads into and out the city and imposed a curfew while declaring the area as a ''closed military area”. jenin camp, established in 1953, is one of 22 refugee camps in the West Bank; it was the second largest refugee camp in the West Bank comprising a population of about 14000 people. Israeli forces attacked the camp using bulldozers, tanks, and apache helicopters. Serious damage was done to the water, sewage and electrical infrastructure of the camp; moreover the occupation soldiers prevented ambulances and the medical teams from entering the camp. This operation continued for about 13 days. Many civilians were killed, many buildings were destroyed which housed several families, and, in some cases, some of these buildings had people inside. Many families were left homeless. And Israeli soldiers arrested some of the camp residents. The exact toll of the dead may never be known as many corps may still be lying under the rubble. Moreover, witnesses mentioned stories of the death of a group of people who where gathering inside their homes. Initial estimates were hundreds of children, women, and men. Israeli officials tried to justify this deplorable behavior against a civilian population by claiming there were about 200-armed men from (Tanzeem) Al Aqsa Martyrs Brigades hiding inside the camp. However, the Israeli occupation army didn't take steps to avoid injury to civilians; moreover they used some of them as human shields. Till now the Israeli government still refuses to acknowledge that what happened in jenin is a Massacre. An independent forensic expert says evidence suggests that a massacre has taken place. And the inhabitants of the camp know too well what those 13 days were; they didn't need a fact-finding mission to tell them. Moreover, Israeli occupation forces had evacuated many other corpses and buried them in the occupied territories (in the numbered "enemy" cemetery) in an attempt to hide the actual number of victims in the refugee camp. The UN Security Council formed a Committee to investigate the massacre but the Israeli government refused to cooperate with the Committee. Upon that Israeli rejection of cooperation, then UN Secretary-General, Kofi Anan, dissolved the Committee before starting its work. Thus, the Israeli war criminals are still free to commit more war crimes, atrocities, and human rights violations against the Palestinian people, without being held accountable for their actions. Media sources in the Middle East and Europe, and to a lesser extent elsewhere in the world, had a field day. Headlines screamed "Massacre", "War Crimes", "Atrocities", "Genocide" and worse. A United Nations envoy has said that the devastation left by Israeli forces in jenin is "horrific beyond belief". Terje Roed-Larsen, who was the UN's Special Coordinator for the occupied Palestinian territories, had visited the camp with Red Cross and UN workers. He toured the jenin refugee camp, and said it was "morally repugnant" that Israel had not allowed emergency workers in for 11 days to provide humanitarian relief. Roed-Larsen said the top priority was to bring in search-and-rescue teams. The only rescue efforts which were under way were residents digging though the ruins looking for survivors. "It is totally destroyed, it looks like an earthquake has hit it," he said. "We have expert people here who have been in war zones and earthquakes and they say they have never seen anything like it," he added. While the rubble had been cleared from the jenin camp, and the bodies buried, most Palestinians felt that the stories they told have been too hastily swept aside. Four months after the fact, the UN did produce a report on the conduct of the Israeli army. Based on secondary sources and internet research, it did not however provide a judgment as much as a venue for Israel and the Palestinians to air their opposing versions of events. “Inevitably the report falls short of a comprehensive inquiry. We found that the report was not satisfactory because it did not address the issues in the depth they deserved,” says Donatella Rovera of HRW. That a follow-up never materialized surprised a few. “This is in keeping with the behavior of the Israeli authorities both before and after the invasion,” continues Rovera. On April 9, 1948, members of the underground Jewish terrorist group, the Irgun, or IZL, led by Menachem Begin, who was to become the Israeli prime minister in 1977, entered the peaceful Arab village of Deir Yassin, which lay outside of the area that the United Nations recommended be included in a future Jewish State, massacred 250 men, women, children and the elderly, and stuffed many of the bodies down wells. Fifty-three orphaned children were literally dumped along the wall of the Old City. There were also reports of rapes and mutilations. The Irgun was joined by the Jewish terrorist group, the Stern Gang, led by Yitzhak Shamir, who subsequently succeeded Begin as prime minister of Israel in the early '80s, and also by the Haganah, the militia under the control of David Ben Gurian. The Irgun, the Stern Gang and the Haganah later joined to form the Israeli army. Their tactics have not changed. A final body count of 254 was reported by The New York Times on April 13, a day after they were finally buried. By then the leaders of the Haganah had distanced themselves from having participated in the attack and issued a statement denouncing the dissidents of Irgun and the Stern Gang. Of about 144 houses, 10 were dynamited. The cemetery was later bulldozed and, like hundreds of other Palestinian villages to follow, Deir Yassin was wiped off the map. By September, Orthodox Jewish immigrants from Poland, Rumania, and Slovakia were settled there. As occupied Jerusalem expanded, the land of Deir Yassin became part of the city and is now known simply as the area between Givat Shaul and the settlement of Har Nof on the western slopes of the mountain. The massacre of Palestinians at Deir Yassin is one of the most significant events in 20th-century Palestinian and Israeli history. This is not because of its size or its brutality, but because it stands as the starkest early warning of a calculated depopulation of over 400 Palestinian villages and cities and the expulsion of over 700,000 Palestinian inhabitants to make room for Israelis from all over the world. The massacre at Deir Yassin was widely publicized by the Israelis and the numerous heaped corpses displayed to the media. In Jaffe, which was at the time 98 percent Arab, as well as in other Arab communities, speaker trucks drove through the streets warning the population to flee and threatening another Deir Yassin. Begin said at the time, "We created terror among the Arabs and all the villages around. In one blow, we changed the strategic situation." But Deir Yassin was not the only massacre by the Israeli occupation armt. That army, under Moshe Dayan, took the unarmed and undefended village of al-Dawazyma, located in the Al-Khalil hills, massacred 80 to 100 of its residents, and threw their bodies into pits. "The children were killed by breaking their heads with sticks ... The remaining Arabs were then sealed in houses, as the village was systematically razed ..." (Nur Masalha, The Historical Roots of the Palestinian Refugee Question). In fact, according to UN estimates, 750,000 Palestinians fled the site of the present Zionist entity in 1948. Those refugees and their descendents now number about 4.5 million and constitute the largest refugee population in the world. Many live in squalid refugee camps distributed in the surrounding Arab states or in the West Bank or Gaza, many retain the titles to their land, recognized by the British before 1948 or the Ottomans before that, and many retain the keys to their front doors of their former homes in the occupied territories, whether or not those doors still exists.